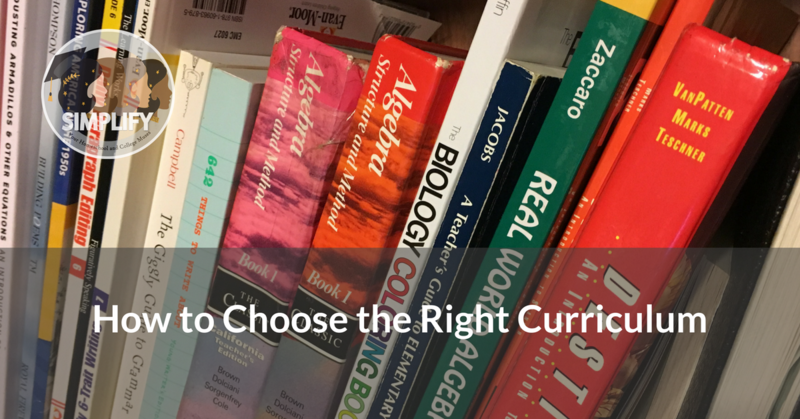 Not sure how to go about choosing a curriculum or textbook? You won’t always get it right. Even seasoned homeschoolers buy the wrong curriculum sometimes. However, you can try! Here are some useful things to consider as you think things through. Do I really need a curriculum? I know this one seems silly, especially to some newbies, but while you probably want some curriculum, you probably also have a lot of things you are either required to teach or want to impart that simply don’t require a curriculum. You probably don’t need a health curriculum in order to make sure your kids understand toothbrushing. You probably don’t need an art program in order to make sure your kids see some art. You may not even want a literature program or a science program or some other more core subjects that can be planned with library books and videos. Then again, you may. Always start with this question. Don’t buy programs for things that you don’t need. Will it suit my kid? Forget all the little details about what bells and whistles it comes with. This is the prime question. If a curriculum isn’t right for the way your child learns and works, then it doesn’t matter how “good” it is otherwise. It’s not right for you. It’s also important that, regardless of what age or grade a program claims to cover, that it be something that fits your child’s abilities and isn’t too difficult or too boring. Remember that just because a curriculum advertises itself as for gifted, reluctant, or some other learning label, doesn’t mean it will be right for your student in that category. Will it suit my teaching style? The perfect program is one that works for your child as a learner and you as a teacher. You have to face your own limitations. If you can’t get something done unless it’s all laid out for you, then remember that. If having lots of components will drive you crazy, take that into account. We all want to teach the children we have and not the children we wish we had, so it’s on us to bend these needs sometimes. However, it’s good to consider what will work best for us. What do the teacher materials look like? Along with suiting your teaching style, pay attention to the teacher materials and how they’re structured. Oftentimes, people seem to judge a program only from the student text without looking at the teacher materials. Teacher materials can vary dramatically. Some programs don’t have much and are written to the student. At the other end, some materials are scripted entirely. Some programs have a great deal of detailed activities while others are just workbook answers. Some have different options and schedules for different learners. If you’re using materials that have complex answers, see how easy they are to find in the teacher guide. Once you get to higher levels of math, consider whether or not the answer key also gives the solutions, not just the final answer. Will it meet my goals? It’s always important to come back to this question. You have goals that are apart from whatever the goals of a curriculum are. Be sure that the textbooks you buy fit into your overall vision. It’s very easy to get sucked into a shiny, new curriculum and get halfway into the year before you realize that you don’t actually think it’s important for your kids to do the things it asks. What are all the components? Do I need them all? Some programs have everything available in one purchase. Other programs have different components. This is especially true of math programs, some of which have supplemental books for more practice or for more challenging problems. More options can be confusing, but they can also make a program more flexible. Be sure you’re getting everything you need to make a curriculum work for you. Look for reviews by different users. There are several large review sites for homeschool curricula that you can use. If you look on forums and do a search through blog posts, you’re likely to find many less formal reviews, but ones by people who may have used a program for longer. Remember to take reviews with a grain of salt. Some reviewers get a money for their reviews or for affiliate links. Also, other families don’t have your kid or your goals so remember that their perfect program may not be yours. Most publishers or internet sellers allow you to see the table of contents and a few sample pages if not more. Make sure the textbook or materials are something that look like you can use it. See how many pages it has to make sure it’s worth the price tag. What is the worldview of the program? No matter if you’re religious or secular, it’s important to make sure that the materials you’re buying fit your basic beliefs. While most homeschoolers know to consider this question for science materials, it can also be important to investigate in literature, geography, history, social studies, and economics curricula, which can have political biases that don’t have to do with religion. All materials will have some level of bias. Just be sure it’s something you’re comfortable with. Do I need to print it or organize it? Make sure you understand how the program works. Many textbooks are available as PDF’s or in online versions now. Others have tiles, cards, math manipulatives, or various science materials you’ll need to organize or take care of. Be sure you understand what’s involved so you don’t get surprised that a program asks your kid to be on the computer or requires that you print lots of pages you don’t have the ink to print.